Jared and I have been teaching the 12 & 13 year old Sunday School class at church for the past several months - almost a year. It is so much fun to be a part of the lives of these kids, and to help them learn how to make good choices that will keep them safe and happy in their future. Today's lesson revolved around the idea of agency, or our freedom to choose what we'll do with our lives. The most important part is that one of these papers is the truth, and one is a lie. On the fronts they look identical, which is the key thing. On the surface it's impossible to tell which choice is right and which is wrong. We talked about what it means to search "in the light of Christ" - and I likened this to using a candle to be able to see in the darkness. Shining a flashlight from behind the paper illuminates the words. At that point it was really easy to read the messages and decide which was the truth and which was a lie. The message here is that when we use Jesus as our example, or our "light" - when we ask whether something invites us to do good, or love God, then just like shining that flashlight through the paper, we can easily distinguish between right and wrong. I gave the kids a printed version of each page to take home and tape to the back of two identical papers and to teach it to their families. 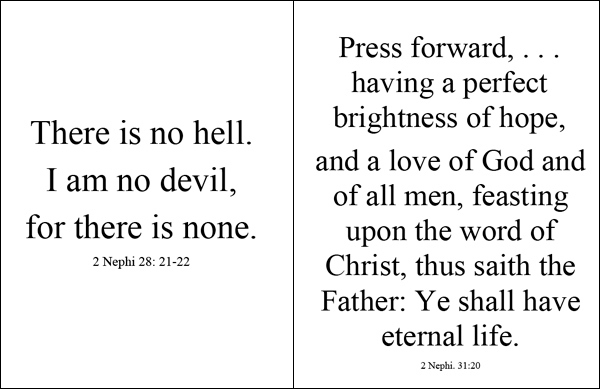 NOTE: Of course if you are not LDS (Mormon, Latter-day Saint), this lesson works equally well with verses from the New Testament - like when Satan is tempting Jesus after His 40 days of fasting (Matthew 4) for the "Lie" side, versus pretty much any of Jesus' teachings for the "Truth" side.